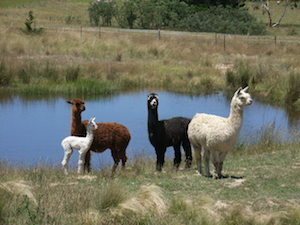 Some months ago I had my three remaining alpacas, Honey, Meru and Mzungu, rehomed. For the past four years they have been happily grazing three acres of my property, but with an El Niño summer looming and grass and water both low and potentially getting lower, I thought it best to get them shifted to a bigger paddock. While they’re now munching their way around a property at Manar and guarding lambs from foxes, I’m suddenly faced with three acres of grass that used to be well-trimmed and now, liberally fertilized from the pacas and watered by early November rain, is growing and waving in the breeze. Once it dries off in the heat I’ll have a snake-harbouring fire hazard. Fabulous. Just what everyone wants! It’s red. It’s shiny. 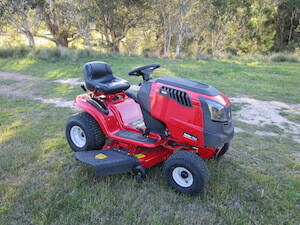 It mows backwards and forwards. It has a stubby holder. No blade of grass is safe! Admittedly, it will be more expensive to feed than the alpacas. They were happy with grass, occasionally supplemented with oats and lucerne chaff. But it won’t need to be shorn once a year and so far it has refrained from spitting on me. It does lack the personality of the alpacas but maybe that will develop with time, and I somehow don't think the neighbours' guests will line up at the fence to take photos of it in the same way that the pacas became the focus of attention on numerous occasions. It will, however, keep the grass down and that's the point of the exercise. All I need now is a little trailer for it, so I can get a 1000 litre water tank rigged up as a mobile watering system for the garden. Took the ferry from Circular Quay over to Milsons Point this morning and walked around the foreshore from Luna Park to Lavender Bay. My purpose? I wanted to have a look at the area of parkland known informally as Wendy’s Secret Garden. 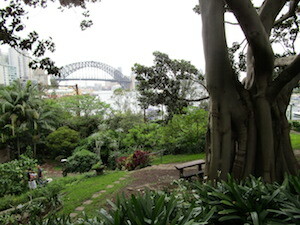 The Wendy in question is Wendy Whitely, and the garden, apart from being probably the worst-kept secret in Sydney, is an area of landscaped and beautifully vegetated harbour foreshore which, until Wendy began work on it after Brett Whitely’s death from a heroin overdose in the mid-90s, was an abandoned strip of land owned by the state government. The house owned and occupied by the Whitelys since the late 1960s overlooks this strip of land and while the stunning view of Lavender Bay and Sydney Harbour feature in many of Brett’s paintings, it was this neglected strip of land into which Wendy channeled her considerable artistic talents after the deaths of Brett and then, nine years later, their daughter, actress Arkie Whitely. This is guerrilla gardening at its best. The state Railroad Commission, which officially owned the land, assisted her endeavours by removing the dead train carriages and bits of industrial detritus that littered the site, but it was Wendy’s vision and labour that, over about 20 years, has created a magical temperate rainforest. Gone are the infestations of lantana and other weeds, and in their place a mixture of native and exotic trees, ferns, vines and flowers. 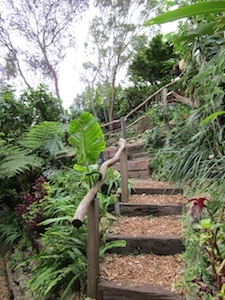 The terrain slopes steeply from the road in front of the Whitely house down to the harbour level and has been terraced with railway sleepers and rocks of the ubiquitous Sydney sandstone. Paths and steps lead around the slope. 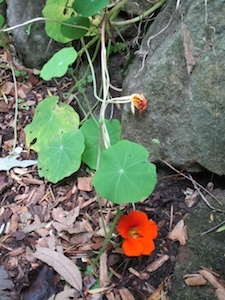 The garden is playful too, and surprising. 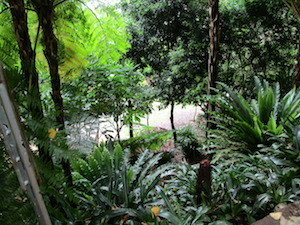 One path ends with a wooden ladder going down to another path lower down, another leads to a sudden clearing with a picnic table under a wooden structure covered with a living bamboo canopy. 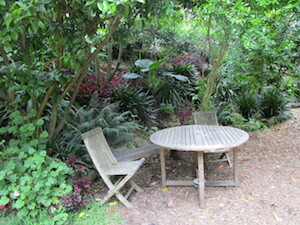 There is sculpture and little tables scattered throughout the garden, inviting the visitor to stay. Be warned, however, that you stay at the pleasure of the mosquitoes! Wendy Whitely was, and is, an artist in her own right, but always remained in the shadow of the formidable artistic genius of Brett, the enfant terrible of Australian art for two decades. She was his muse, but in his absence, her own talent has come to the fore in this giant living canvas. All the time she was carving out this garden she was aware that it was on government-owned land and that they could come in and redevelop it any time they wanted. The good news is that the state government has officially recognised the value of the garden as public parkland and has handed it over to North Sydney Council. 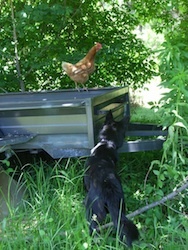 In this way, the garden will remain a public asset, as Wendy always intended. The ashes of both Brett and Arkie Whitely are buried in the garden, but Wendy has never disclosed the locations. The garden and Wendy are the subject of a book by Janet Hawley just released by Penguin Australia: Wendy Whitely and the Secret Garden. My rain gauge recorded 2mms of fog overnight. That heavy dripping sort of fog that rolls off the top of the mountain, creeps down the creek bed, blankets the paddock and drenches everything without actually raining. I love it, and while it’s not the 20-30mms of rain that my garden needs, or the 80mms needed to fill my dam and tank, at least it keeps everything wet and stops the evaporation. This morning I can’t see the mountains and after an hour walking Rocky to the national park and back we were both wet through. The hour was actually only 40 minutes walk to the Deua campground and back and 20 minutes trying to get one of the neighbour’s calves back in its paddock. Somehow one calf had managed to get through the fence and was grazing on the side of the road opposite my gate, with its mother pacing up and down on the other side of the fence bellowing for it to go back. As soon as the calf saw us it headed off down the road, tried to headbutt its way back through a locked gate and then took off down the main road.